Mecca has unveiled plans to build the world's largest hotel by 2017. The Abraj Kudai Hotel will be built in the Manafia district, just south of the famous Grand Mosque. 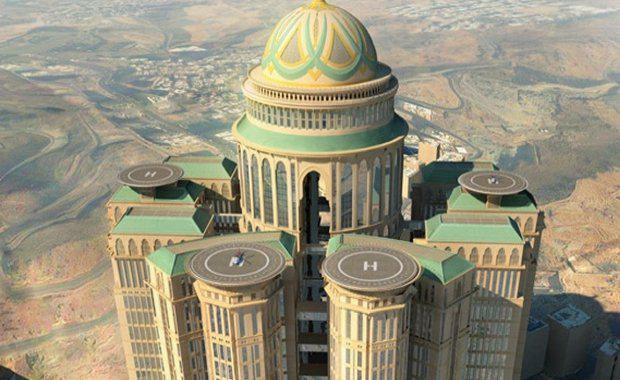 The hotel will stand at almost 686,000 square feet and house 10,000 rooms, 70 restaurants, an entire shopping mall, five 'royal floors' for sole use by the Saudi royal family, conference centre, ballroom, and all will be set within a cluster of 12 towers topped with helipads. The Grand Mosque itself is undergoing significant expansions, with an estimated $40 billion being spent to double the capacity of its prayer halls - from 3 million worshippers now to nearly 7 million by 2040.